The De'Longhi Elements Bundle includes a kettle and a 4 slice toaster; both designed with an exclusive tactile finish and chromed details. The complimentary kitchen appliances will bring an elegant touch to any kitchen décor. 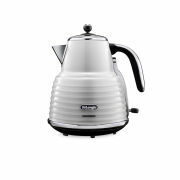 The stylish De’Longhi Elements Kettle has a generous 1.7 L capacity and a 360° detachable swivel base for convenience. A water level indicator ensures only the required quantity of water is boiled each time. Three levels of safety protection include an auto shut-off when water begins to boil, a thermal cut-off and an auto shut off when the body is lifted from the base. A removable and washable anti-scale filter within the spout ensures high level water quality. 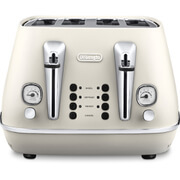 Featuring electronic controls lit by a neon indicator, the stainless steel Elements toaster has four wide slots and reheat, defrost, one- side bagel and cancel functions. 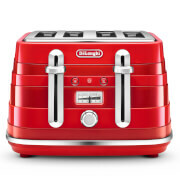 A progressive, electronic browning control, extra lift position for smaller bakery items and twin removable crumb trays ensure the perfect slice of toast every time.